The MePACS 24/7 personal alarm has made huge advances in saving and improving the lives of everyday Australians over the last 25 years. Now Australian healthcare workers in the community can be added to the list of people who are benefitting from MePACS. 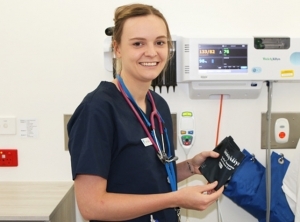 The new MePACS Duress Alarm is making a huge impact in Australia’s health care system, with more than half of Melbourne’s public hospital networks now using the cutting-edge technology for their staff who make potentially dangerous visits into the community. In Frankston and the Mornington Peninsula, where Peninsula Health is based, the Duress Alarms have had a particularly strong impact on staff. An impressive 77% of Peninsula Health staff using the MePACS Duress Alarm now feel safer when working out in the community. Of those staff using the MePACS Duress Alarm at Peninsula Health, 90% feel that the organisation supports and values their safety because they are offered the new technology. The new MePACs Duress Alarm is a cutting-edge personal safety device; with help just the push of a button away. The new Duress Alarm gives healthcare workers the confidence to go out into the community and visit clients, knowing that if help is needed, they just have to push a button. It is NBN compatible and backed by the major public health network, Peninsula Health. Matthew Baynes is a senior clinician in the Adult Community Mental Health team at Peninsula Health who has benefitted from the MePACS Duress Alarm. “Unlike a mobile phone, you can quickly press the blue button for help, you don’t have to go through your contacts and unlock your mobile phone, and it’s very simple and crucially a lot quicker.” Real people based in Australia monitor the MePACS Duress Alarm every minute of every day. The mobile alarm has two-way communication with the MePACS team and a built in GPS locator so they know where to send help quickly. It is innovative technology, which helps healthcare workers feel safer in their daily work knowing that help is available quickly.